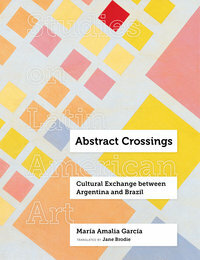 Books in the Studies on Latin American Art series encompass studies of art history and cultural practices emerging from Central and South America, the Caribbean, and the Latin American diaspora in the 20th and 21st centuries. International and cosmopolitan in scope, the series seeks to address the production, exhibition, and dissemination of art in and between countries and continents, present and analyze innovative research concerning intellectual content-making in Central and South America, and broaden the public for exciting new scholarship on the area. Titles in English, as well as translations of exceptional studies by Central and South American scholars, will be featured. Topics include art history, exhibition history, investigations of the relation between the art and social context of specific nations, comparative analyses of different cultural traditions and milieus, in-depth monographic examinations of important artists or artistic collectives, and interdisciplinary works that bridge the fields of art history, media studies, architecture, literature, film, anthropology, and cultural criticism. Those interested in submitting to the series should send a proposal, a CV, and a writing sample, preferably from the book project, to Alexander Alberro or Nadine Little. This series is supported by a gift from the Institute for Studies on Latin American Art.